Photosynthesis is one of the most important biological processes in the world. It works by using photosynthetic reaction centers (RC) — specialized membrane proteins — which collect the energy from light and use it to pump electrons across a biological membrane from one cellular electron carrier to another, resulting in the conversion of electromagnetic into chemical energy, which can be used by organisms. 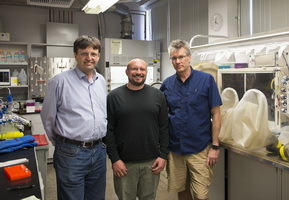 A team of scientists from Arizona State University (ASU) and Pennsylvania State University has taken a step closer to unlocking the secrets of photosynthesis. The research team believes that the first reaction center was simpler than the versions available today. In terms of the protein structure, it was a homodimer — that is, two copies of the same polypeptide came together to form a symmetric structure. The reaction centers whose structures we know are all heterodimers in which this inherent symmetry has been broken, although at their heart they still retain the vestiges of the original symmetric architecture. The research showed the first homodimeric RC structure and it sheds light in several ways on what the ancestral RC may have looked like. The overall architecture of the protein is very similar to photosystems of plants and cyanobacteria and the RC of the purple sulfur bacteria. More details are available at ASU Now.